There is something to be said about inflation. It’s a number that is stubbornly refusing to rise. January inflation came in at just 2.05%, a near-two year low. And it’s happening like this: the inflation index is actually falling – and falling even more than it fell last year. Which brings us to the components. While food is still an important part of the index, it’s still “deflating” – prices of food items are falling, in general. This is usual for January (as winter crops come abound) but we see that this time, there was more “abundance” than last year. Medical costs continue to inflate at massive levels (9%) and Education at 8% is also moving really fast. Housing, Clothing, Fuel and Transport inflation is low. 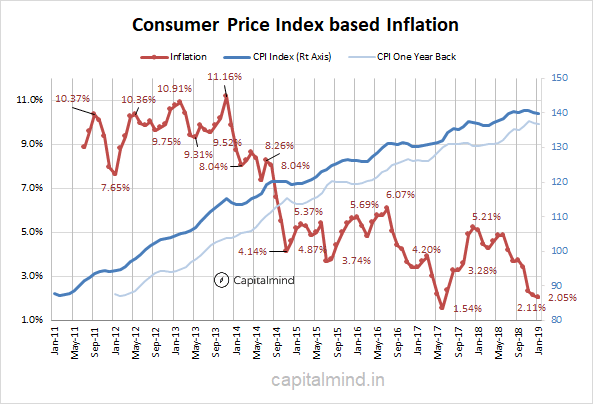 The fear that RBI mentioned clearly was: Core inflation is still too high. Well, that’s changed too, apparently. 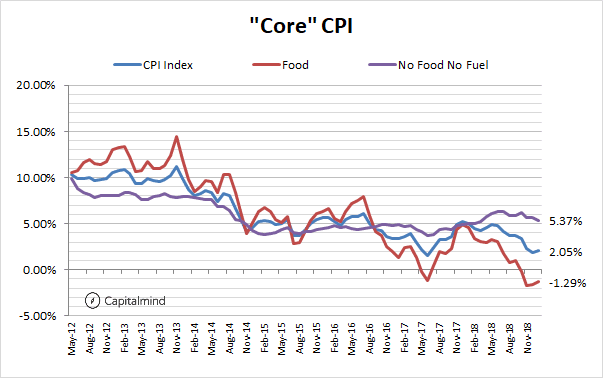 As you can see, the purple line (“core” inflation, removing food and fuel products) is now softening. Inflation there has fallen from near 6% down to 5.37%. Core inflation is a serious concern if it rises, because food and fuel prices will be volatile. This data nearly confirms the view that inflation should moderate. In fact the RBI had predicted a 2.8% average inflation for the whole Jan-Mar quarter – and we start it much lower, at 2.05%. If inflation is consistently lower then it makes sense to cut rates further. The 10 year bond yield is still high at 7.53%, and the data came in after market hours today. Let’s see how it reacts tomorrow. 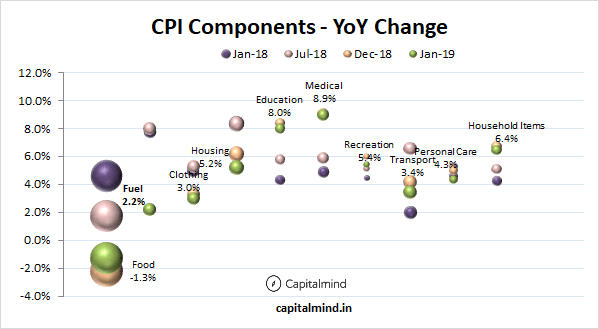 The wide gap between inflation (2.05%) and the RBI repo rate (6.25%) is a little too high. Additionally, it’s clear the economy is seeing an impact as well – part of lower inflation is simply from falling growth. There’s an NBFC liquidity crisis on, and real estate companies too are struggling with debt. All of this, together, is confusing. But the RBI will look at inflation (and growth) and will have to cut rates going forward. 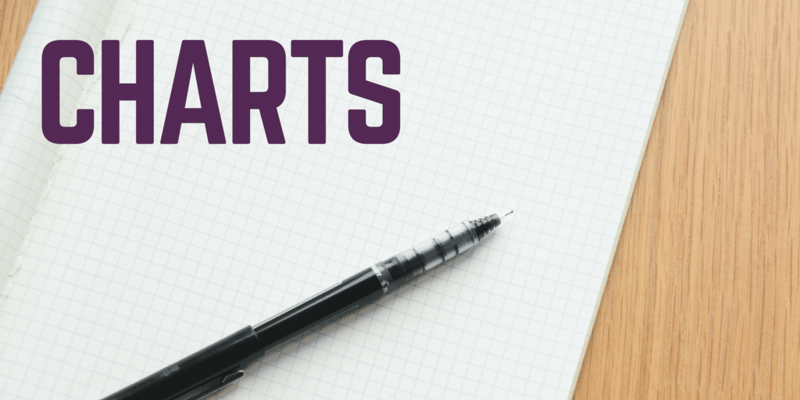 If you are a saver (or investor in fixed income) you need to plan for a change in cash flows in this year.